Like with most contracted projects, it is important to choose your countertop installation company carefully. Not only do you want quality work, but you also want to know that you are getting the best value for what you pay. When you are installing naturally mined stone in large slabs, moreover, it is especially important to work with a company that guides you through every step of the process. Do you know what factors to consider when choosing a contractor for your quartz or granite countertops? Be sure to choose a company that has been doing business in your area for at least a few decades. They should have experience working through the entire fabrication process and understand how any local climate or other environmental conditions may affect installation and maintenance. You should also check online reviews and ask your own family and friends if they can offer any referrals for companies that work in granite countertops. Some contractors also offer references for new clients to consult. 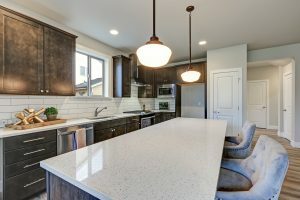 For projects like granite and quartz countertops, it is important that you are able to see the exact material before it is installed in your home. These natural stones often have irregularity in their design and you should know what the piece looks like before you finalize your choice. Choose a company that lets you see the slab and the cut template during the fabrication process. Many conscious consumers these days are thinking about the environmental impact of their purchases. This is especially relevant when dealing with mined materials like granite and quartz. Look for a contractor that uses sustainably sourced materials and even domestic suppliers (such as Cambria quartz) which reduce fossil fuel emissions in transportation. These factors can help you make the right decision for choosing a contractor for your quartz or granite countertops. Be sure to get a quote for a few different companies and make your final selection based on quality and budget.